Accumulation of dead skin cells, friction, extensive exposure to sun, or a hormonal imbalance can become the cause of dark knees and elbows. These parts of our body don’t contain any oil glands and it’s important to protect them from dryness through proper care and hygiene. We’ve got 10 easy yet super effective techniques to help you nourish your skin and remove dark patches. Cucumber removes dead skin cells and keeps your skin moisturized. Vitamins A and C that are present in cucumbers keep the skin beautiful and fresh. The combination of Aloe Vera and milk is a simple and useful way to lighten your skin naturally. You can extract the gel from the Aloe Vera leaf and apply it to your knees and elbows. Leave it on for 20 minutes, and then wash it off with warm water. 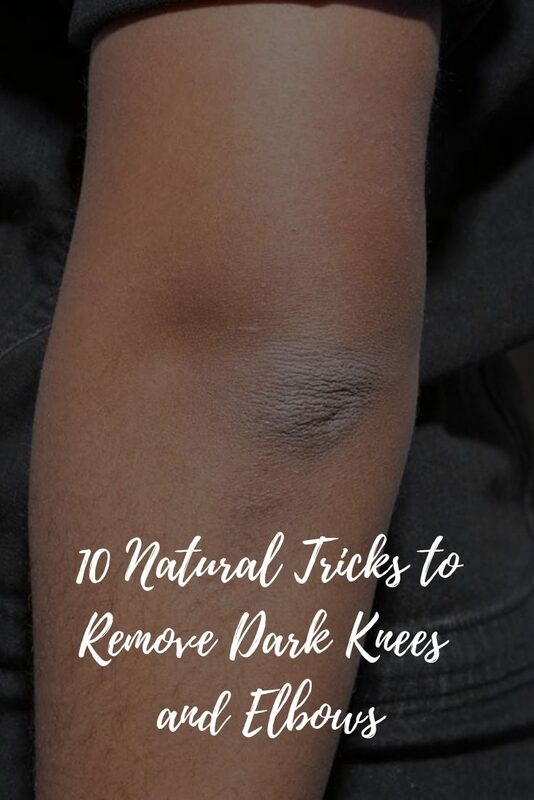 Rub your elbows and knees with a potato cut into slices for about 10-15 minutes and then wash off to get rid of dark areas. Turmeric contains a compound called curcumin which reduces and regulates the excess production of melanin responsible for dark complexions. Add 1/2 tsp of fresh lemon juice to 1 tsp of coconut oil and gently massage your knees and elbows for a few minutes for a lightening effect. Sugar and olive oil scrub can be used to cleanse your face. Just make sure to not rub too hard, as it may hurt your skin. Combine 2 tbsp oatmeal with 2 tsp of milk and message the dark areas for 10 minutes. Then rinse it off with water. It will make your skin feel soft, smooth, healthy, and radiant. -Due to its bleaching properties, cucumber is among the most effective ways to get rid of dark knees and elbows. -Lemon is packed with antioxidants and vitamin C which promote skin regeneration and improve skin complexion. Baking soda acts as a gentle and effective cleanser for whitening dark areas of skin. -Aloe Vera contains substances that help to moisturize your skin and improve uneven skin tone. It also has anti-bacterial and anti-fungal properties. -Potato is rich in catecholase enzymes that can naturally lighten your skin tone. Daily usage of potato will soften your skin and help you get rid of dark areas. -Turmeric is the most natural remedy to remove impurities and dead skin cells from your knees and elbows without any side effects. -Coconut oil is packed with essential fatty acids and vitamin E that help to repair dark and damaged skin. -Honey acts as a natural moisturizer. In combination with lemon it can work wonders on your skin. -A homemade scrub made from sugar and olive oil will nourish, hydrate, and remove dead cells from your skin. -Along with having a lot of benefits for health, oatmeal is another effective way to have a flawless skin tone. -The rich content of acetic acid in vinegar and lactic acid in yogurt will help to cleanse your knees and elbows and reveal glowing skin. -Stand on tiptoes for 20 to 30 seconds. Repeat 5 to 10 times. One of the best exercises for strengthening weak ankle muscles and ligaments is to take the beads off the floor one by one with your toes, and place them into a glass. wait a minute.. why am i watching this if i have no problem?? just keep using bath sponge with your fav soap or body cleanser. It might not have instant effect, but certainly helps in the long term. be cautious to use food in whitening your skin, cause there is plenty of pesticides sprayed, no one wants adding toxins on darkened skin. I have a party tmw. This helped me A LOT! Can I use it for dark neck as well ?? I love this video, it’s so understanding and full of nature. I almost forgot what she said . ?? Its is no sideeffect it is really work. We can use on thighs. Does any of those would give an instant reaction or not? does anybody know if any of these work??? Can I use all of them for a quicker effect? Is coconut oil and baking soda just as effective as lemon and baking soda? frankly,i'm a asian,and this is just what my elbows need to do.